Hello! I've played your game for some hours and I gotta say... it's a great game! :D I really enjoy it. The music, the guns, the enemies, the artstyle, I think it's really well done. My highest score is level 17th. 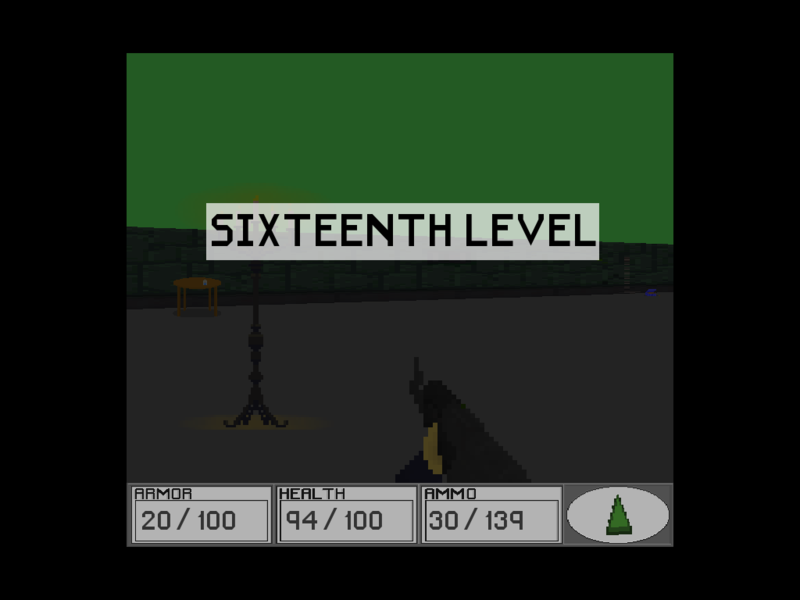 Although I wasn't able to screenshot the moment were it said the level, I did get the screenshot of the 16th. My game crashed In the middle of a gunfight, and I sent the crash report to your pastebin page. 1.- Less ammo spawns: all anemies drop ammo, even the lower ones like zombies (who particullary drop gaus ammo). I think that the ammo drop could be lowered in general, but also the type of ammo that is droped by certain enemies. I think that zombies could drop lower ammo like bullets and cauges, while the ak guys could still drop every kind of ammo, but reducing the possibility of dropping higher ammo (gaus). In my opinion, the gaus gun is very powerful so it's ammo should be a lot less commonly dropped by enemies. 2.- The red shirt ak guy: oh boi this dude is strong, maybe nerf a little. 3.-Bosses: I think some bosses here and there could really spice up the game a little. I'm thinking maybe some low/not so powerful bosses every 5 levels, and a big strong boss every 10. 4.-More enemies: Variety on enemies is always good, but that's not my point. I mean rooms with more enemies, the most I've encountered in a single room is about 4, and would really like a lot more, especially in big open rooms like the ones where there are 4 pillars on the corners. those could have at least 7. Also, a big quantity of enemies in the rooms with the door to the next level could be fun, and challenging. 5.- Faster animations: Especially on the death of enemies. The animation is very slow in my opinion, and most times I find myself shooting 2 extra shots to killed enemies because I don't see the animation starting. 6.-Better A.I: the ai is good, but it gets boring after a while. Every npc's movements are the same, move a little, shoot, move a little, shoot, repeat. And if they loose sign of you, they'll just run away. I think that it would be cool if they chased you down, and maybe crouched while shooting, fliped and hid behind tables, or jumped to avoid bullets. I think they need more actions, stuff that makes them unpredictable. It would also be cool if you could sneak up on enemies, or tackle them. 7.-More interaction with the level itself: You can't do anything with the enviroment, and I think it would be really fun if you could use it to fight too. For example: putting chairs that you can grab and punch your enemies with (until they break) and tables that you cand either grab to use as a shield, or flip down to use as cover. Maye putting stuff over the tables so when you or the enemies flip them they fall to the floor and break, and that you can grab to hit your enemies with them, like bottles and stuff. It would be cool if there were really dark rooms where you aren't able to see anything unless you take a torch from a wall with one hand while shooting or hitting with the other. Overall: I think that the game is really fun, but I think that I could be even more fun if it was a lot more challenging. I want the feeling of fear as I run out of ammo and have to defend myself with my knife while tons of enemies chase me down. And that's all I've got, I hope I was usefull and didn't bored you with the long post "o~o Have a nice day, and greetings from México! Thank you very much for your feedback and suggestions. I don’t have a pastebin page (at least I don’t think so) would you send me the link to the crash report? Your suggestions were really nice and I agree with you on most of them. People have very different opinions of the ammo spawns, and I found this amount to be the best suiting without major changes to the generation of levels. I have tried to implement multiple of your suggestions, like more enemies and darkness. However, both features take their toll on the performance, so I scrapped them. Thanks for the feedback! I am glad you enjoyed the game.